Today in Concord and 9th's Feature Friday, we are looking at Trim the Trees stamps and dies. The dies themselves are your classic Christmas tree, star and "fa la la" dies, and the stamp set has great coordinating tree decorations and fun holiday sayings that fit perfectly on the tree. I made many alcohol ink backgrounds, and wanted to show you different ways to use these bold organic patterns. The first way is using it as a background, and to me it works best if you add minimal die cuts or stamping in neutral colors. This allows the vibrant background to stand out. I have two cards in this style, and my first one has just a few white die cuts. I die cut the Christmas tree to make it a couple inches shorter, so i could use it on a horizontal card. These would make a great forest! After gluing them on my alcohol ink backgrounds, I used a white Sharpie to add stars to the night sky. I then die cut the words "fa la la" from white cardstock and put it in the upper left corner. This scene would also be great for a Silent Night or Peace on Earth sentiment. Then for some added texture, I used pearlescent Nuvo Drops to add texture to the sentiment and the Christmas trees without adding any distraction. This makes a great simple but beautiful card! For my next card I used two layers of vellum Christmas tree instead of white cardstock to allow the color of the background to come through a little. I used one of the coordinating sentiments with black pigment ink and clear embossing powder on the top layer of vellum. I glued the two layers of vellum together using small amounts of glue behind the sentiment. I added some gold and green tinted nuvo drops for some texture and embellishment, and this card is good to go! 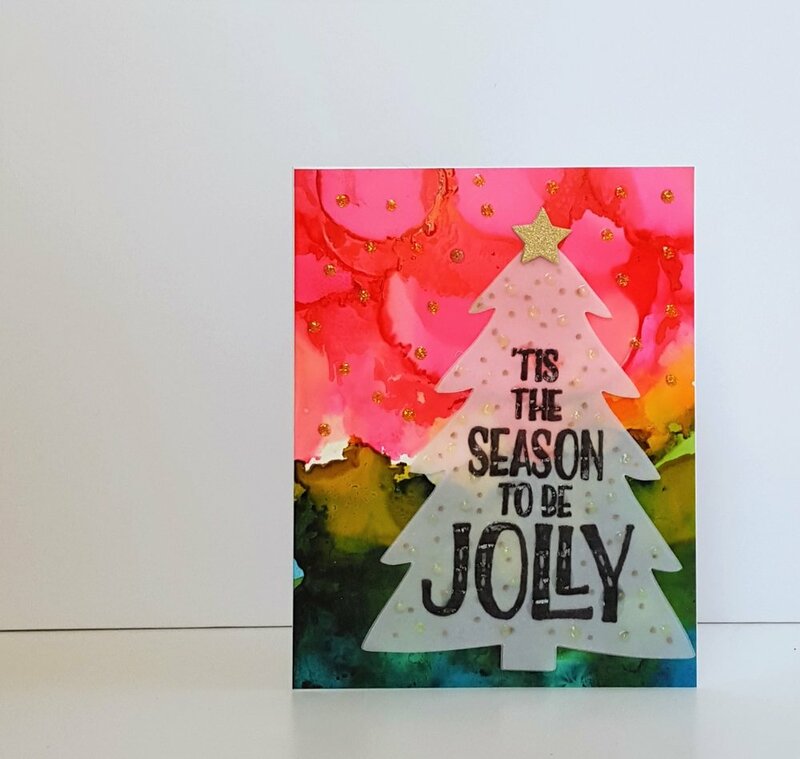 The second way to use bold alcohol ink paper, is to use it as a focal point, using a bold or large die cut. So, I decided to die cut the Christmas tree from a green alcohol ink background I created. I then took copper paper and embossed the plaid background stamp in gold ink on top for a luxe background. I trimmed down this panel to have a pale green border to reflect the green in the tree. to keep these colors the main focus, I added my sentiment and embellishments in white. And this card is done too! This simple card design allows the alcohol ink to be the focal point. the third way to use your alcohol ink backgrounds on a card, is just to use it as an accent instead of a focal point. 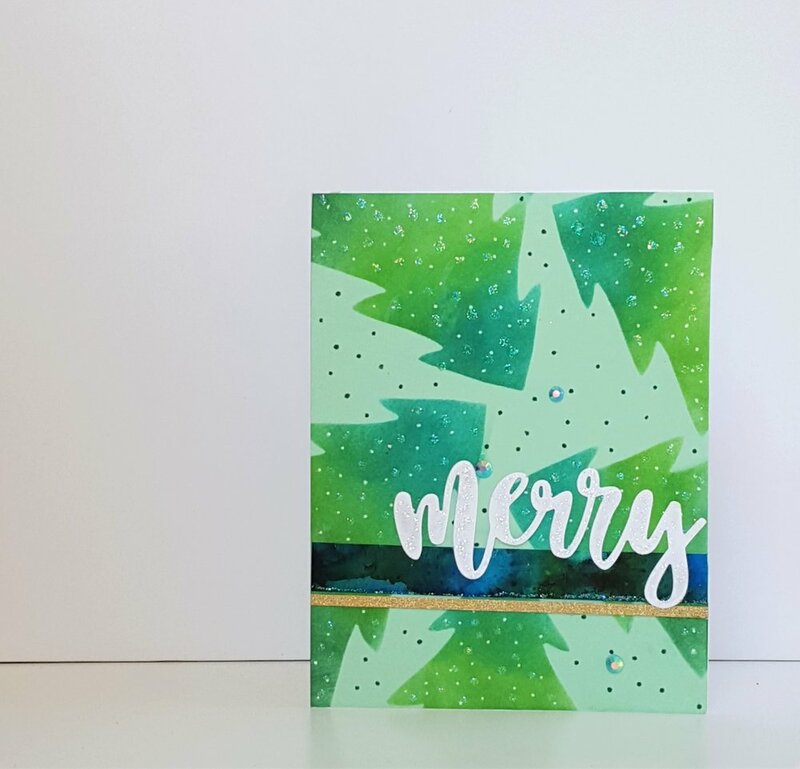 For my last card, I die cut the tree from scrap paper, and used it as a stencil to create a background with distress ink blending with three shades of green on pale green cardstock. I then used the back of a paint brush to add dark green dots to the background, and a white gel pen to add to the Christmas trees. I then added some clear sparkly Stickles on the Christmas trees for sparkle and texture. I then added my sentiment in white, above a strip of green alcohol ink and a thin strip of gold glitter cardstock. There are obviously many ways to use alcohol inks on cards, but these are the three ways I used today. I hope you stop by Concord and 9th's blog to see even more inspiration using Trim the Tree stamps and dies. Perfect for classic Christmas cards! Hope you are well, and if you celebrate, have a fun and safe Halloween! Neat and Tangled Guest Designer for November - Coupon Code & Sneak! I'm a Designer on a Blog Named Hero!